MIDDLEBURY — It is impossible for a team to win its conference in the opening week, but it is very easy to take yourself out of the running early in the schedule. 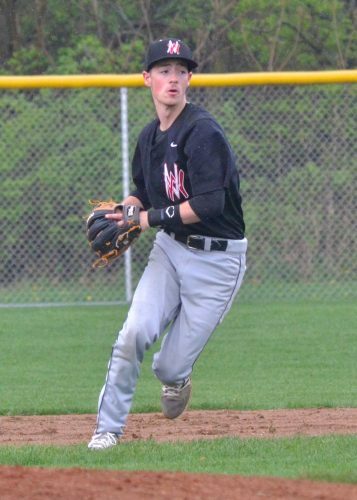 Wednesday night’s game between NorthWood and Northridge at Raider Field may prove to have big implications on the Northern Lakes Conference standings at the end of the season. Both teams entered on six-game winning streaks and holding a 1-0 mark in league play. While it was not a must-win contest, it sure felt like it for the Panthers as they were able to close out a 7-2 victory over the Raiders. There was just one out on the board in the top of the first inning before the two teams had to wait out the rain. Thankfully that was the only delay on the night despite off and on rainfall. NorthWood appeared to be bothered by the weather at first, showing no life on offense in the first and then cluttering the bottom half of the frame with mental mistakes that led to a 2-0 lead for the Raiders. Cody Bible and Nick Hooley scored the runs for the home team. The second inning saw both team go down in order at the dish and the Panthers finally got things going offensively in the third. It all started with a leadoff single from Matt Dutkowski. The sophomore would prove to be the first run of the game for the Panthers and started what ended up being a four-run inning for the visiting nine. 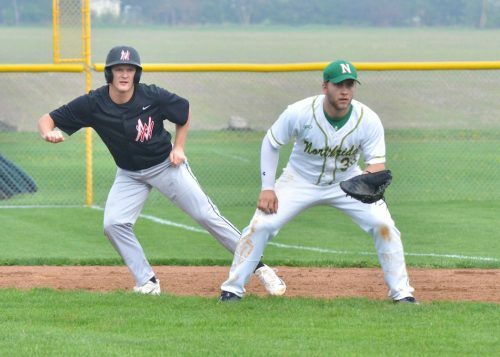 In addition to Dutkowski, Hunter Warren, Drew Minnich and Brant Mast all scored in the frame, the latter two coming on wild pitches while the former were on an RBI double from Warren. 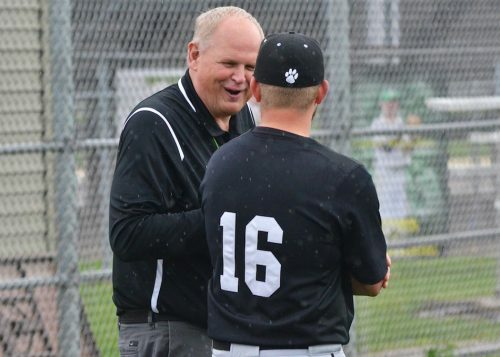 Northridge AD Dave Harms shares a laugh with NorthWood coach Jay Sheets during Wednesday’s rain delay. Things kept breaking NorthWood’s way in the fourth as a leadoff walk of Jarron Mullet led to a sacrifice bunt for Hunter Warren. That sacrifice attempt ended up being a series of errors from the Raiders that allowed Mullet to score and Warren to advance to third. Warren was later brought in on a sac fly from Minnich. 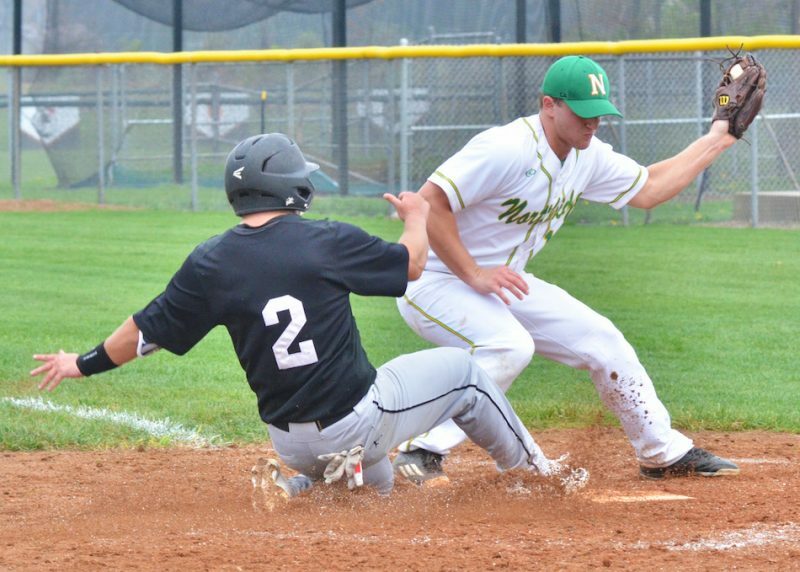 Northridge finally managed to force NorthWood’s starter out of the game after four and one-third innings of work, but that only proved to be bad news for the Raiders. As soon as sophomore Alec Holcomb left the game, senior Vincent Herschberger came in and secured the win. 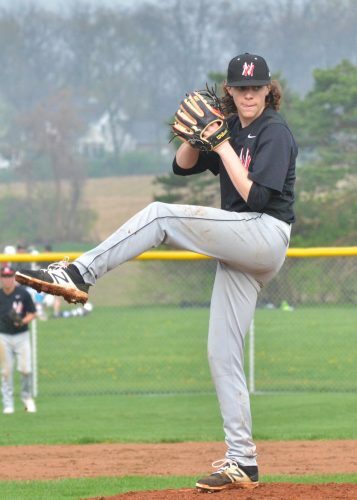 Herschberger struck out three in his two and two-thirds innings of shutout baseball on the mound. 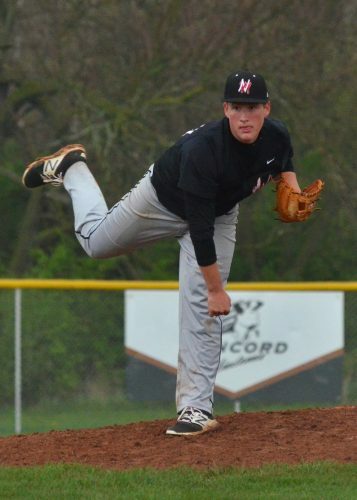 Holcomb, meanwhile, had zero earned runs, was able to secure the win and did not go unnoticed by his coach. “He’s a sophomore and we’ve been watching him closely all winter long,” Sheets began to say of Holcomb. “He’s got a lot of good stuff and he’s got a lot of upside. It’s going to be fun to see what he’s like when he’s a senior. He’s a guy that shows no emotion, doesn’t show you if he’s happy or if he’s sad. He could be really mad and you could look at him in the face and he’s the same kid. Drake Gongwer was 2-3 with a double for the Panthers, Mast had the team-high two RBIs while Payton Bear finished 2-3 with an RBI. NorthWood (7-1, 2-0) will look to stay hot Friday night when it hosts Wawasee (3-2, 1-1) at 5 p.m. 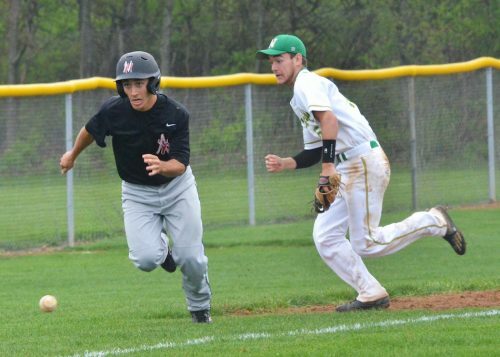 The Warriors were 11-6 winners over Memorial Wednesday evening. 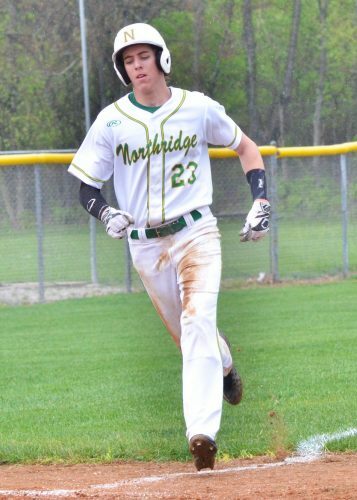 Northridge won the JV contest 11-3. Cooper Davis was 1-2 with two RBIs for NorthWood. Cody Bible crosses home for the game’s first run. Drew Minnich takes off for second behind Northridge’s Nick Hooley.